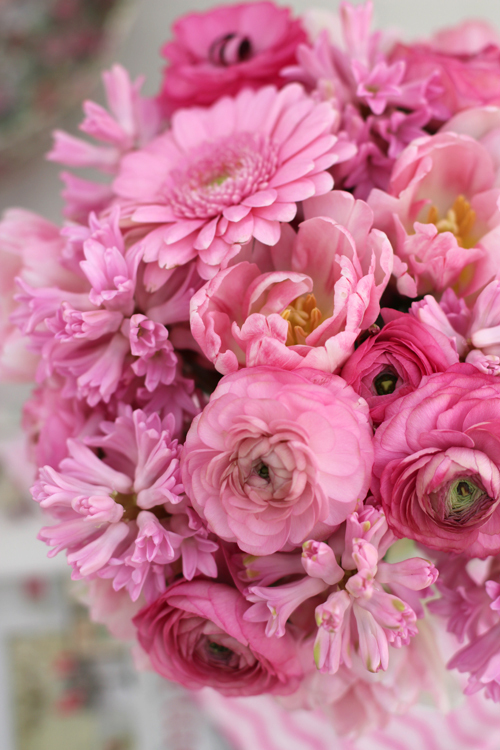 Are you looking for some inspiration for Valentine's Day? Here is an adorable little video to put you in the mood! Here are also a few links to help you on the way. All from Funny How Flowers Do That. 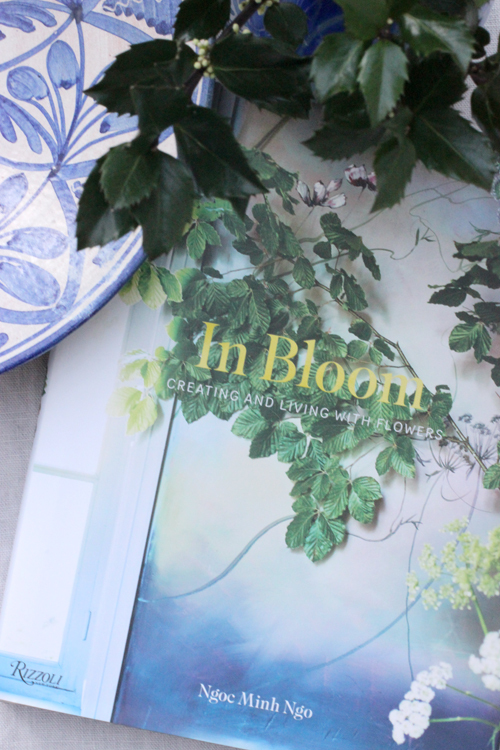 I haven't done a Floral Media post for a while - but when I saw this delightful and beautiful little video - I just couldn't resist. The video is just over two minutes long so please take the time to watch it. Enjoy the meticulous cutting, colouring, painting, shaping and stitching of the flowers. Music: Matthew Herbert: Titles from A Fantastic Woman soundtrack. 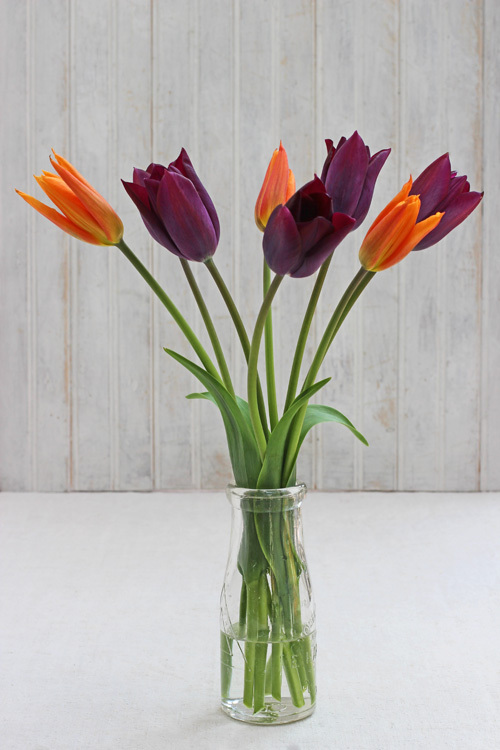 Today is Tulip Day in Sweden or Tulpanens Dag as they would say over there. This post is from January 2016 - when I did a whole week of tulips. Below are some links from back then. Here, here, here, here, here, here and here. 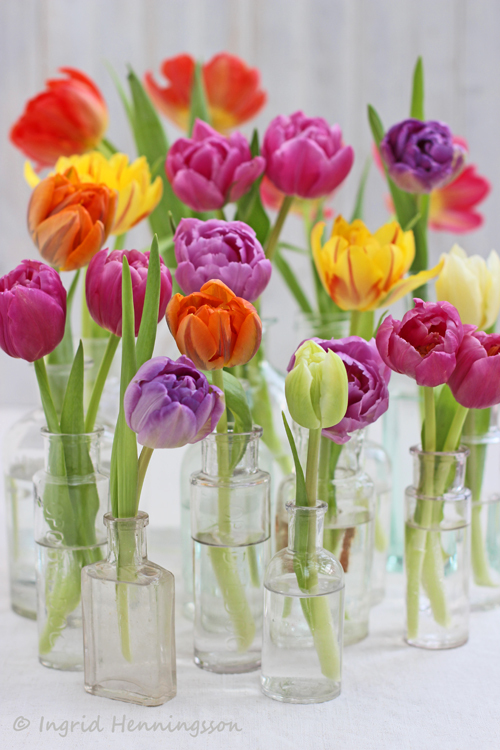 Well, today it is all about tulips......!! 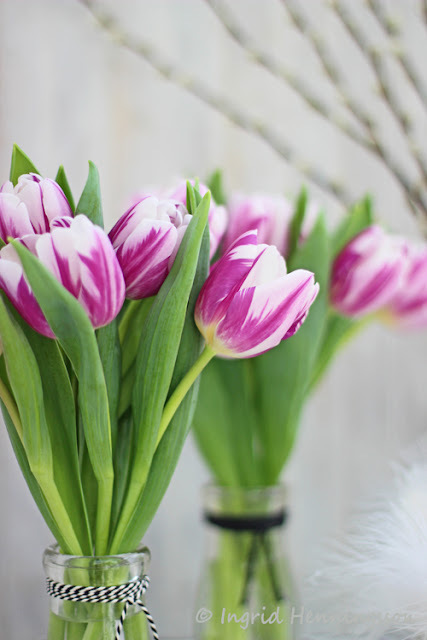 Today on Tulip Week - Day 6 - I'm doing a little bit of styling with tulips. 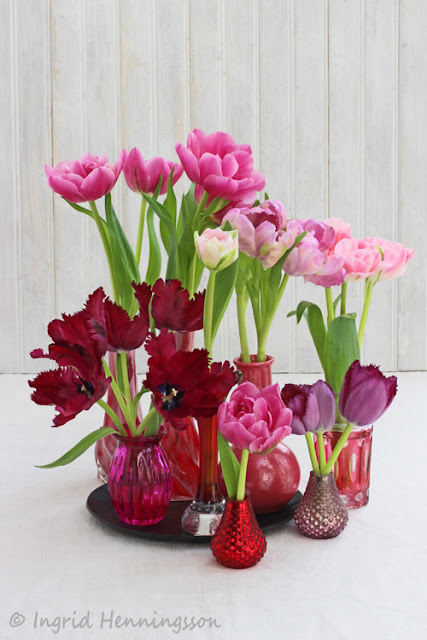 In fifteen images I'm combining tulips with some unusual containers, fabrics and other ornaments as well as a few mixed arrangements. 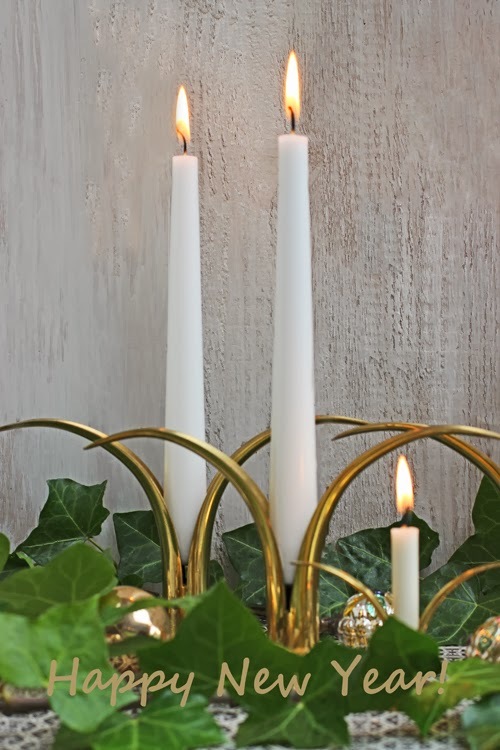 In the first image I have used fourteen little clear vintage glass bottles and put one or two flowers in each. But instead of spreading them out around the house I've grouped them together - that way they will have much more impact. 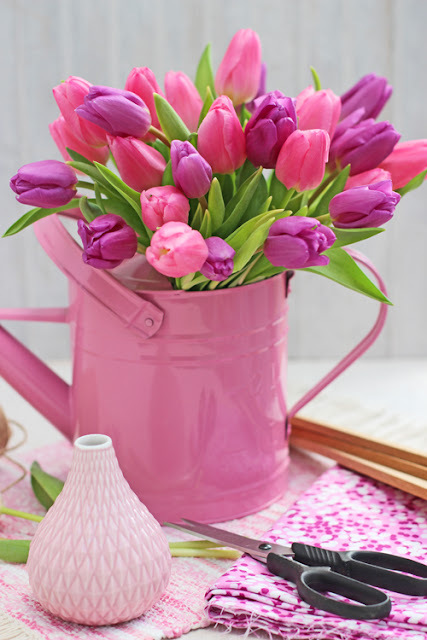 In the image above I've used a bright pink watering can as a vase and filled it with tulips in a few different pink colours. A different and fun way of presenting the flowers. A handful of tulips in each of the two vintage milk bottles. I've decorated the bottles very simply with some contrasting twine. In this one I've used a collection of vintage and new red vases and added some of the more unusual tulips such as parrot, fringed, double and multicolored. I have also put some of them on a black metal plate to pick up the black center in the darker tulips but also to anchor the whole arrangement. For these tall and very elegant tulips I'm again using a vintage milk bottle. 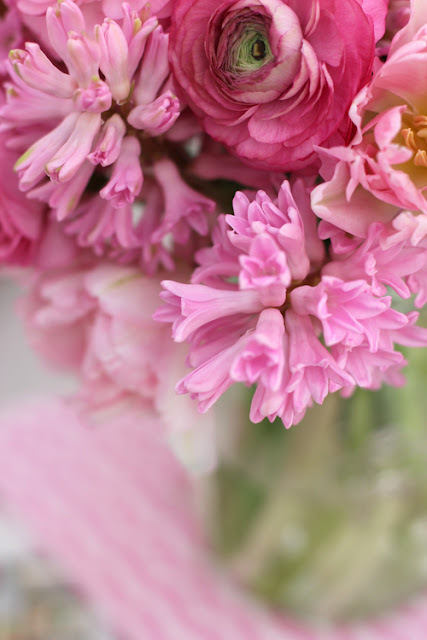 An uneven number of flowers are arranged very simply with just a few leaves left on as a little ruffle around the long stems. 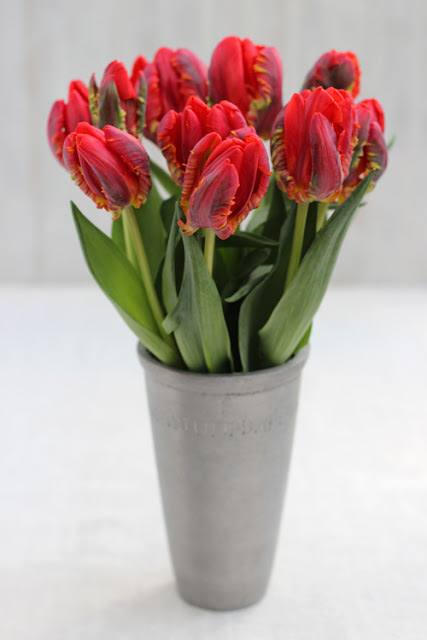 Red parrot tulips are so dramatic that they need nothing else to take the attention away from the flowers. 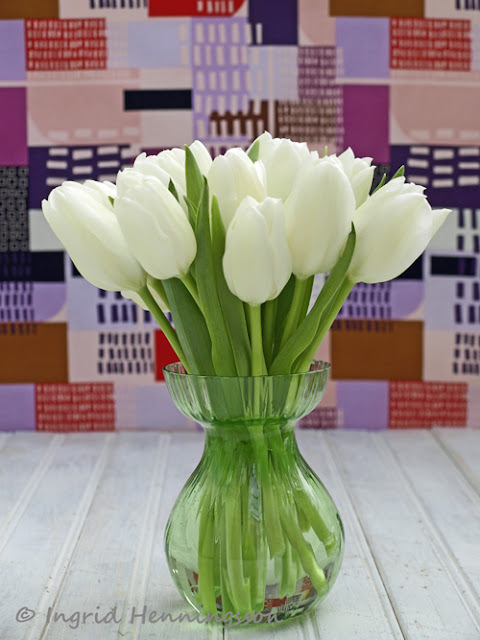 Here they are arranged in a tall but plain and neutral grey metal vase. 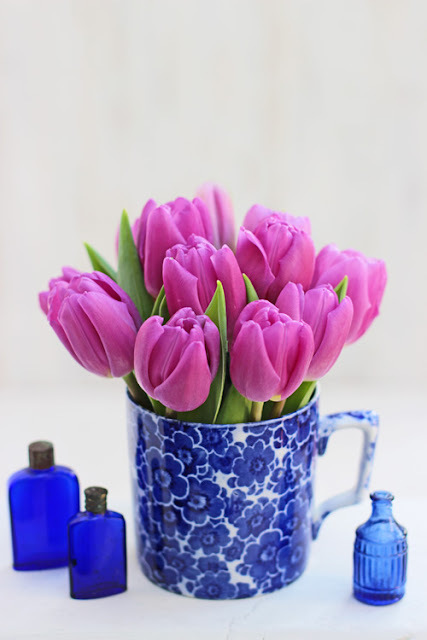 I have used a antique blue and white floral patterned cup as a vase for some deep pink single tulips. They are cut very short just long enough to sit above the edge of the cup. 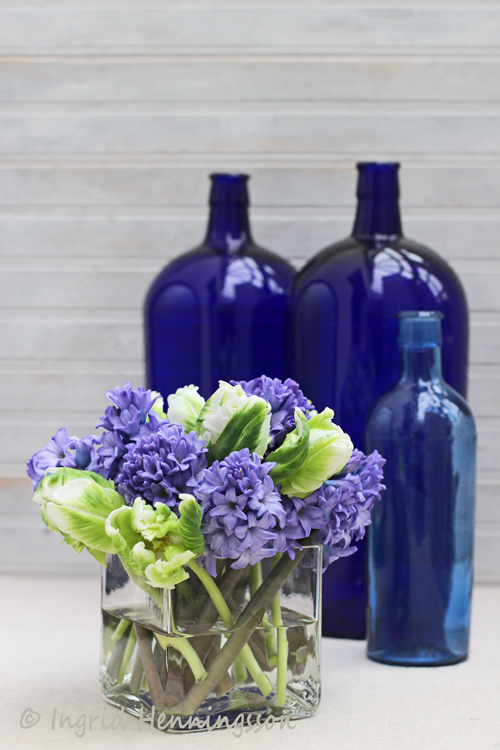 The arrangement is finished off with the addition of three little mini dark blue glass bottles. In the next few arrangements I've combined the tulips with different fabrics. Around the house we often have fabrics such as curtains, cushions, rugs, blankets and table cloths. Yellow is not an easy colour to combine with other colours. 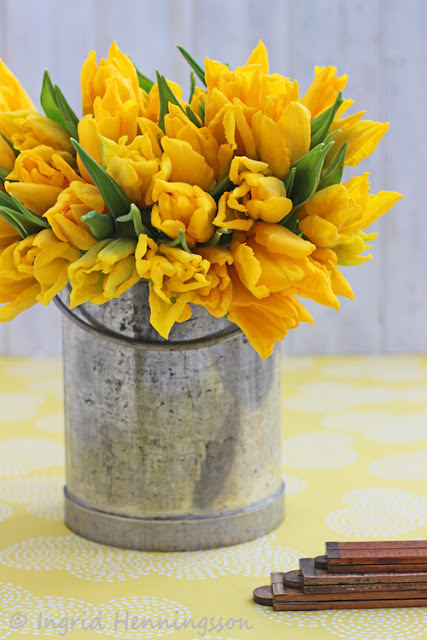 Here I've arranged curvy edged bright yellow tulips in a vintage milk can on a light yellow fabric. Some fresh and bright white tulips in a green vintage bulb vase. In the background is an abstract patterned fabric that looks like buildings with rows of windows. Pink and purple tulips in a vintage jug that has a wide band of pink around the middle. 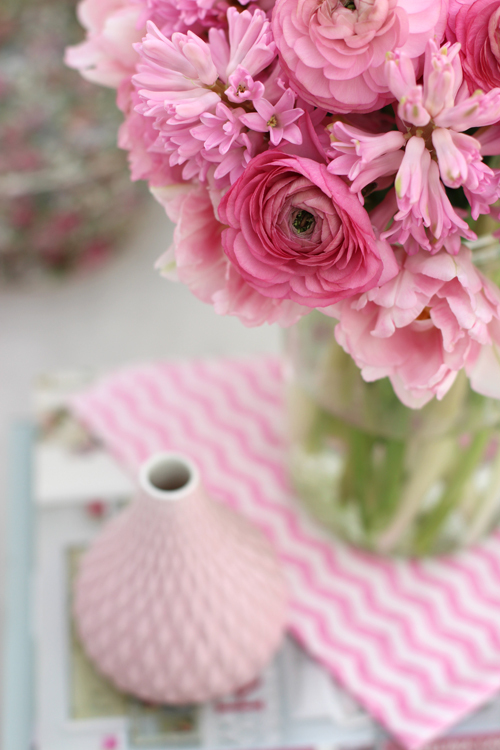 In the background is a striped fabric in pink and white picking up the pink colour in both the flowers and the jug. In the next few images I've made some very simple mixed arrangements often using just one other flower. 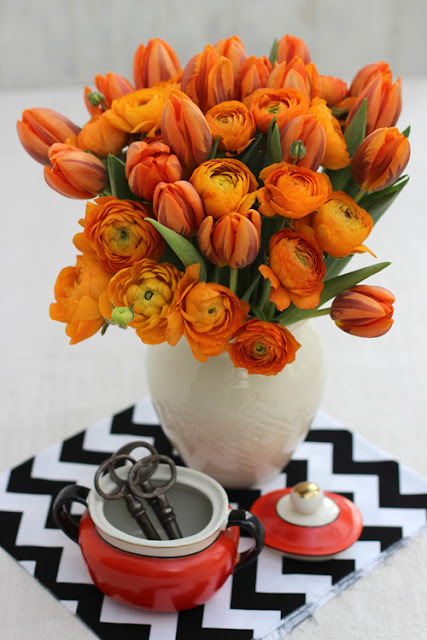 Multicolored orange tulips mixed with bright orange Ranunculus - becomes a dramatic and vivid arrangement. It needed a stark and crisp black and white chevron fabric to offset all the orange! 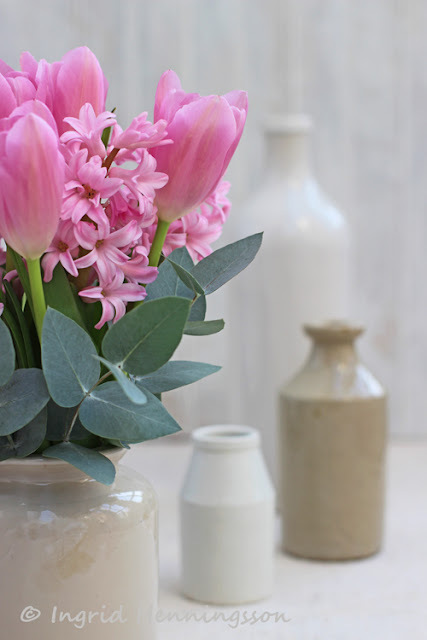 Here is a mixture of pale pink tulips, pink hyacinths and Eucalytus foliage. An interesting mix of quite pale colours so not to overwhelm the flowers I have chosen to use very pale cream ware containers. The one with the flowers is actually an old mustard jar and the tall bottle in the background is an old Japanese sake bottle. 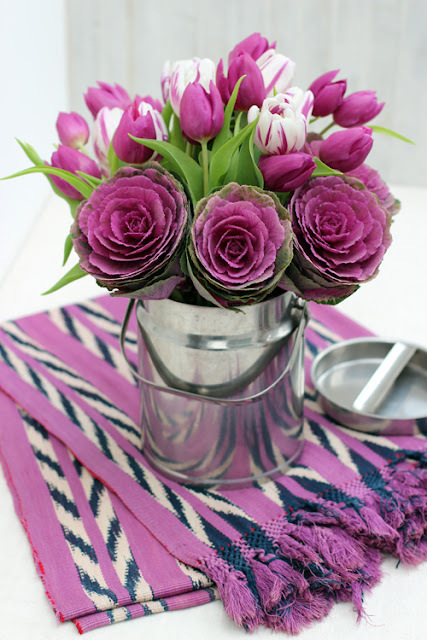 Strong colours can be teamed with other strong colours like here where deep pink tulips are mixed with matching ornamental cabbage, also called brassica - the Mexican fringed shawl also matches in colour. Some unusual green parrot tulips is happily mixed with blue hyacinths. 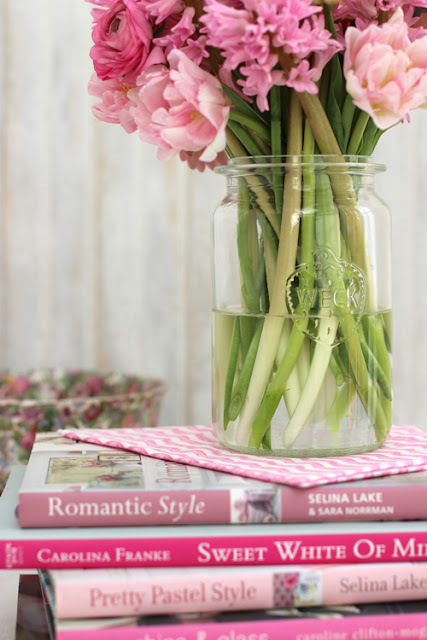 Cut very short and arranged in a clear glass cube. The dark blue vintage bottles in the background makes the flowers stand out. 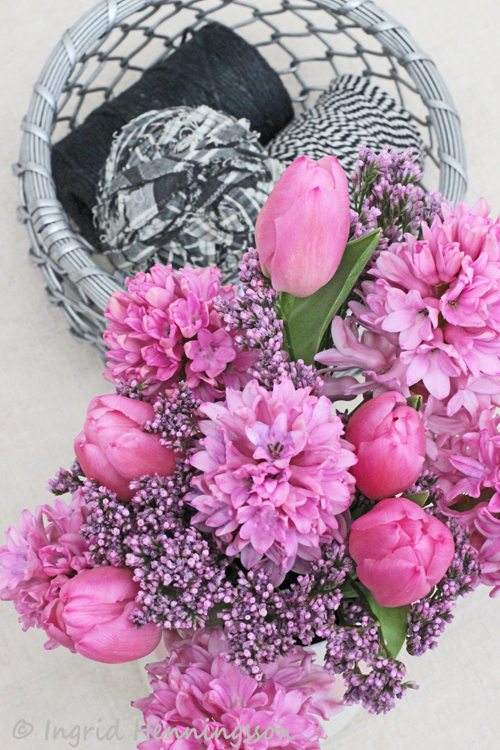 In the final arrangement I have mixed pretty pink tulips with gorgeous pink hyacinths. On the side is a casual metal wire basket with twine and a ball of torn rags for weaving rag rugs. 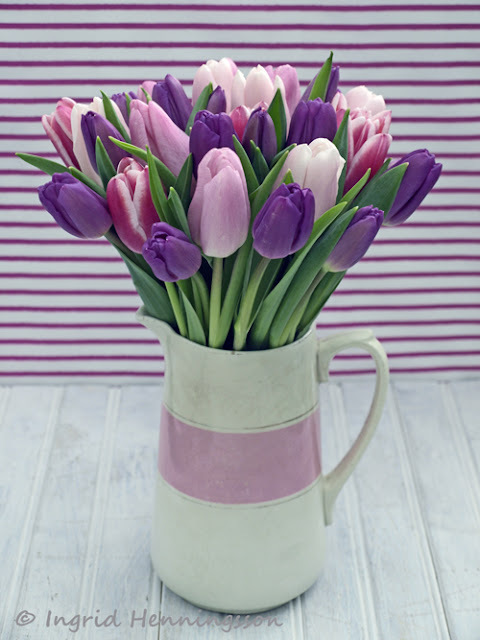 Have a fabulous Tulip Day!